I was wasting time one night, just watching random clips on YouTube, and somehow I stumbled onto some interviews that Jeffrey Dahmer did years ago. I’ve always found Dahmer to be a fascinating character, not because of the absolutely horrific nature of his crimes — and if you somehow harbor any doubts about that, I invite you to Google “Dahmer Crime Scene Photos” — but because of how he slipped through the cracks for years and, when caught, ultimately took full responsibility for his crimes. The latter quality has helped make Dahmer, in the words of someone else (I can’t remember where I first read this description), one of the more pitiable serial killers. That’s certainly a relative comparison, but take two other noted mass-murderes for reference points — Charles Manson and Ted Bundy. Perhaps the most remarkable aspect of the entire Dahmer story, at least for me, is how close he came to being caught at one point. One of his heavily drugged victims, a 14-year-old boy, somehow managed to drag himself out of Dahmer’s apartment while he wasn’t there. The kid was uncommunicative, naked, and bleeding from a part of the body no one should be bleeding from. A couple of women came across him on the streets and managed to get the attention of two police officers. Dahmer showed up almost simultaneously with the cops and managed to convince them that the kid was 19, his lover and simply drunk out of his mind. The officers even escorted Dahmer and the boy back to his apartment, where he showed them (and another officer who joined the two originals) some explicit pictures of the boy as proof of his “intimate” relationship. Not wanting to get in the middle of a gay spat, the officers washed their hands of it, and that was that. Unbelievable. The best part? There was a rotting corpse in the bedroom. Here’s where the comics angle comes in. This ability of Dahmer — or perhaps it was his curse — to go through life creating hardly any wake at all is one of the underlying themes of My Friend Dahmer. Written, drawn and self-published in 2002 by Derf (John Backderf), who was a classmate of Dahmer’s, it’s 24 pages of brief reminisces from Dahmer’s high school years that are sad and chilling in the magnifying glass that is retrospect. There isn’t a great deal of depth to Derf’s knowledge of his subject, only vignettes from their acquaintance, but that’s a part of the story in itself. No one truly “knew” Dahmer. There are strange incidents throughout, most significantly Dahmer’s egged-on impersonation of a woman who suffered from cerebral palsy. He’s often drawn in shadow, indicating both his future descent and his present (at that time, and until his death) outsider status, and there’s a general restraint with the art and the prose that’s so refreshing with subject matter like this. The final pages, with the last encounter of a member of Derf’s clique with Dahmer, are 100% guaranteed to make your hair stand on end. It’s a gripping tale. If I have one complaint about My Friend Dahmer, it’s a minor one. Derf draws himself and Dahmer in much the same way, which caused some confusion when I was reading the comic. It was confusion that was easily cleared up, so no harm no foul. 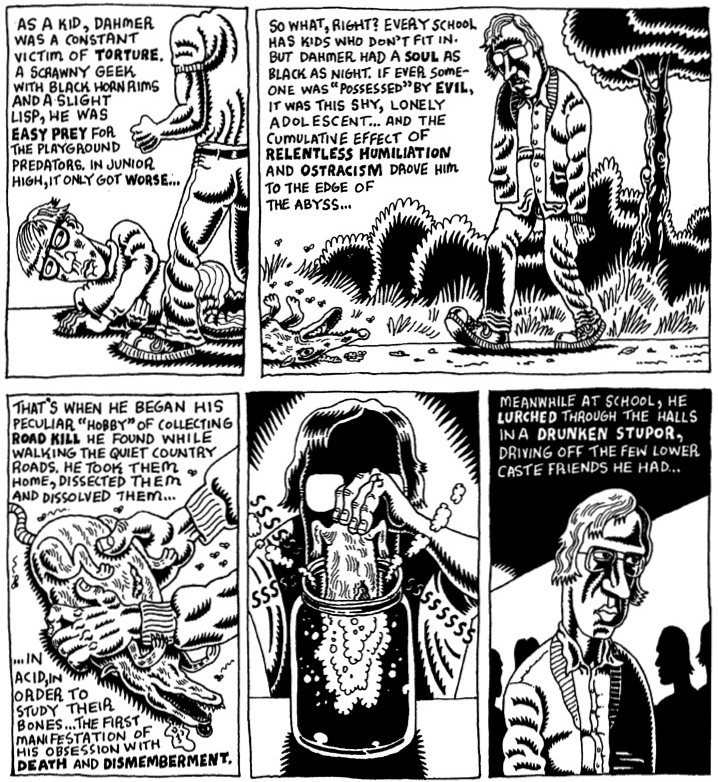 And — not a criticism, but an observation — doesn’t Dahmer in that last panel above look a bit like James Woods? Maybe? Derf’s book is a true achievement. I’ve been familiar with his newspaper cartoons for some time, but this was the first comic of his that I read, and I was duly impressed. 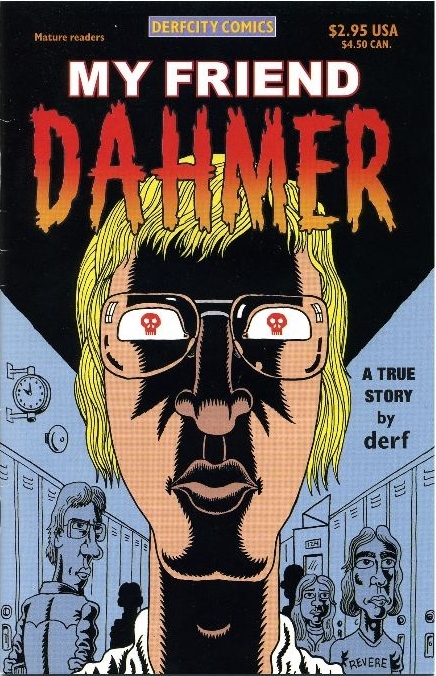 Not only does it assuredly outdistance the wafer-thin exploitative Dahmer comics that were published only as a means capitalize on his crimes — it also stands as perhaps the best book about Dahmer period. And his whole point, that if someone had just stepped in with Dahmer — and maybe even tried to help him integrate with the world — tragedy might have been thwarted, is ever-relevant. So many times as I was reading the comic I thought back to those policemen, the three blind mice who saw no evil. A lot of us grew up knowing someone who was like the Dahmer that we find in these pages. I did, a kid I knew for twelve years who always dressed in black and rarely spoke and whose father tried to commit suicide by blowing his brains out in front him. At one point in the comic Derf and his friends, in a scene that takes place years after the core high school events, joke that Dahmer, who had fallen off the radar by that point, probably became a serial killer. I’ve sometimes mused over what happened to that kid that I knew, and I’d be lying if I told you that I never thought that about him. If there had been a “Most Likely to Keep Someone Chained Up in His Basement” category in my high school yearbook, he would have had my vote. It’s probably the universality of that sort of painful marginalization, and the sort of psychoses that it can spawn, that’s the most frightening thing of all, and that’s what makes this book so powerful. Some final housekeeping… My Friend Dahmer is available at Derf’s website, where you can also view some sample pages, and he’s interviewed in parts one and two of a documentary on this subject that you can see here and here. Jeremy Renner, who’ll be playing Hawkeye in The Avengers, starred as Dahmer in the 2002 film entitled, you guessed it, Dahmer. Use that worthless trivia however you wish. Lastly, I hope it’s a long time before I write another word about this individual — I feel like I’ve been spelunking for a month in the darkest cave on Earth. The comic sounds interesting. But you know, even with the bullying in school and so forth, and without knowing too much about the guy, I can say that his reaction to it was definitely his own. I was a fairly nerdy guy in school–glasses, too smart to relate well to others, and obsessed with comics and SF novels–and I had several friends who were similar. We were no strangers to ostracization or bullying, but what I’m struck by when I see these same people as adults is how well-adjusted most of us are. If anything, our backgrounds made us more sensitive to how other people are treated, rather than embittered at the world. Again, I know very little about Dahmer’s background, but I can’t help but think at many points, he himself could have chosen to tread a different path. 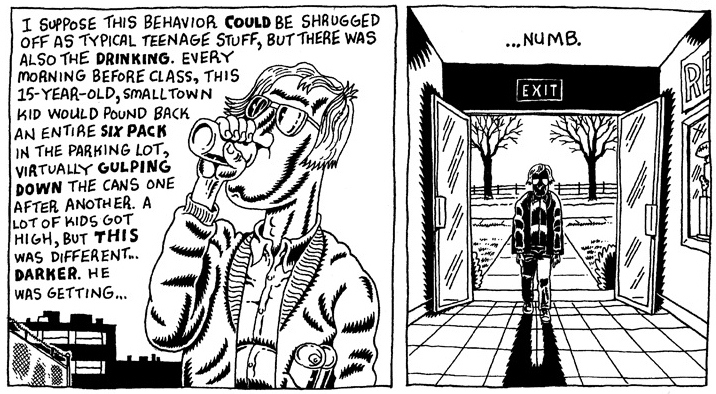 I think part of this comic’s point is that Dahmer didn’t have any friends. The ostracism was total. Complete. Utter. Even Derf’s clique (band/sci-fi/comic nerds), who were the only ones to interact with him in any sort of nice way in his latter high school years, regarded him, in Derf’s own words, as a “mascot.” They’d egg him on to act out and that was about it. That, combined with his parents splitting and leaving him alone in his house (his father had a job in another town and his mother left town with his younger brother), led to an awful degree of isolation. I don’t want to get too deep into this — the more one tries to explain the mind of a serial killer, the more it sounds like excuse-making, and that’s not a road I want to go down. And I’m sure as hell no expert on the guy. As for whether Dahmer could have gone down a different path, perhaps he could have. I think he suggests in the interview clip that I posted that he could have taken up taxidermy or something to satisfy his fixation on dead bodies. Who knows? Dahmer had had an interest in road kill and dissecting dead animals for a long time. When puberty started those interests began to intertwine with his sexual fantasies, and Dahmer didn’t feel like he could talk to anyone about them. He described his home life as stressful, with his parents fighting constantly, eventually divorcing and paying little attention to him. He said the divorce was very traumatic for him.